Home / Musical Instruments / Keyboards & Pianos / Digital Pianos / New Jersey Sound 54-Key Digital Keyboard Kit with Keyboard Stand and Headphones!! This New Jersey Sound 54-Key Digital Keyboard Kit, including Keyboard Stand and Headphones is an excellent first keyboard for the young learner with a keen interest in music. The instrument features 54 keys and 200 different high quality timbres (voices). With the 128 built in rhythms, or from your USB drive (via the built in USB audio player) you can play along to set rhythms and backing music. 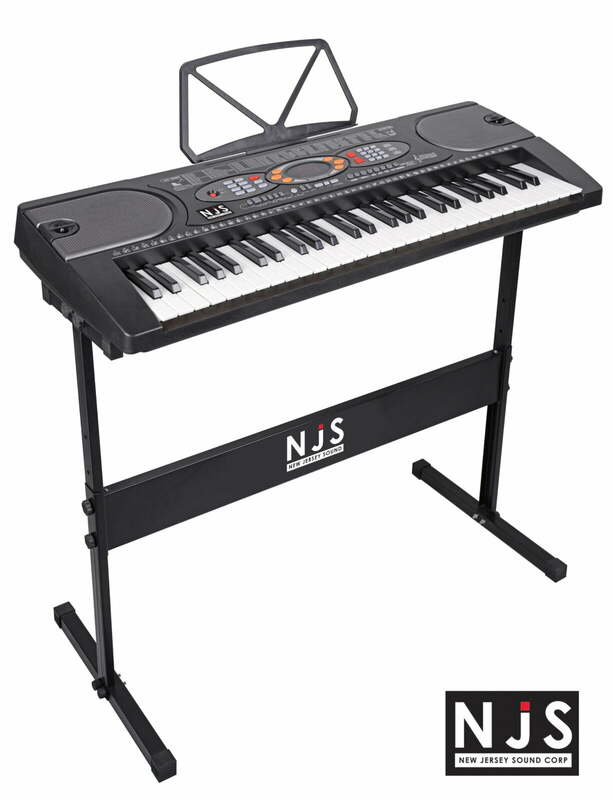 Learn to play with the NJS 54 keys musical key board using single-finger or multi-finger chord modes. Auto trigger the backing rhythms to the chord press, and enjoy many more features such as “Transpose”, “Sustain”, “Vibrato”, “Split Voice” and “Dual Voice”. Record your playing to the onboard memory and play it back to listen, or play over. Input and a sheet music stand. This unit can be powered by batteries. Comes complete with an attractive keyboard Z-stand the kit also includes a built-in sheet music stand, mains adaptor and stylish neckband headphones. 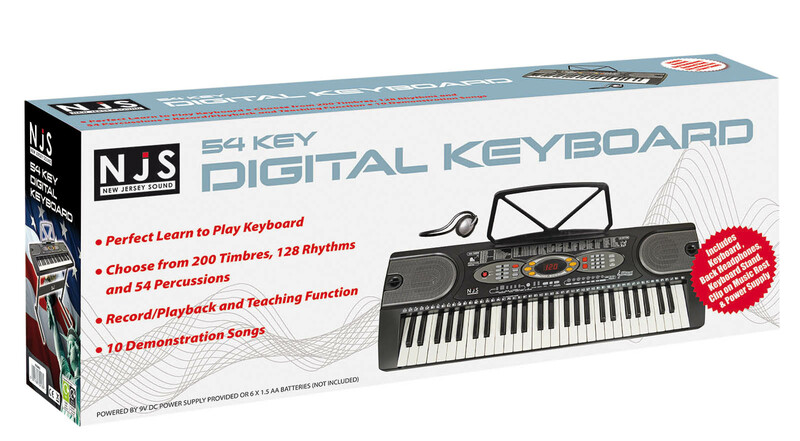 For any Questions about our New Jersey Sound 54-Key Digital Keyboard Kit; or for Prices on delivery to the EU please contact us. Or; why not visit our Facebook page and follow us? You can see ALL the latest info as it happens!